Acrylic painting, 16 x 20. A portfolio piece, it is for sale if you want it. Please contact me for details. "Cometary Bliss" is a sequel to my painting "A Long Time Ago When the Earth Was Red." 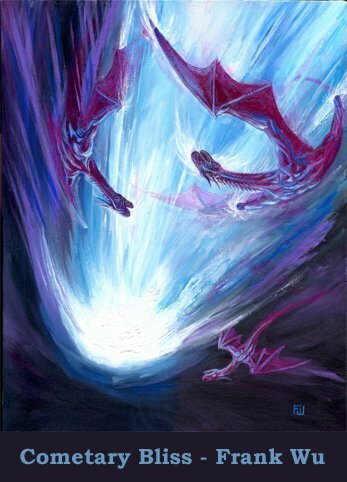 Here we see the comet-chaser dragons. 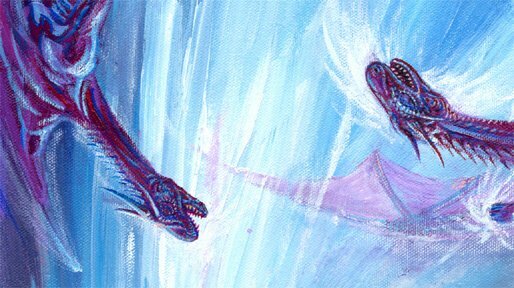 Unlike most dragons, they lack both front and rear legs - they are almost like snakes with wings. The absence of the extra weight in muscle, bone and ligament helps them achieve the phenomenal speeds necessary to chase comets and frolic in their tails. At night these dragons sleep upside-down, hanging from their prehensile tails. Notice that there are actually two tails on the comet. The bright tail going to the upper right is the "dust tail", made of bright particles shed by the comet as it follows its elliptical path around the Sun - thus this tail is near-white and slightly curved. In contrast, the second tail, going up the left side of the painting, is straight and not as bright. This "ion tail" points directly away from the sun and is caused by the solar wind. Indeed, a comet's ion trail is one of the best proofs for the very existence of the solar wind itself.